Help End the Cycle of Poverty! Not having enough money to have the things we want, when we want them, is disappointing for anyone. But genuine poverty means not having enough money for the things you want most of the time. It also means that you very often don't have money for even the most basic things you need: food, clean water, clothing, a place to live. Families can become trapped in poverty because they can't scrape together enough money or resources to get the things that would help them (or their children) create a better life. Without money they cannot buy land, tools and equipment, or send their children to school. In fact even in many places where school is free, the children must work with the parents, simply so everyone can eat. Sometimes people are so poor they must go a little hungry every day, and so eventually become too weak or sick to work at all. What's even sadder is that violence and wars make it even harder for families to work or grow food. At Earth's Kids we know that this chronic poverty is not just a human crisis but also an environmental one. Human beings who are struggling to survive, who are scared they may not be able to feed their families tomorrow or next week, will do whatever it takes to find the next meal for their loved ones. In many parts of the world this means killing endangered animals and/or cutting down their habitats to create new places to farm. It sometimes means cutting down every single tree in the local area to provide wood for fires to heat homes and cook food. These actions are extremely harmful to wild animal populations. But they also end up causing greater poverty and hardship for the local humans as well. In some regions the disregard for the environment has led to a massive ecosystem collapse. When this happens the land cannot provide for anyone, not for humans and their livestock, and not for wild creatures. Even in wealthy nations like the United States people faced with economic hardship may feel they have to do whatever it takes to provide for their families, even working for or buying from companies who hurt the Earth. And worse yet, when times are tough it is easier to talk people into overturning the laws that protect the Earth and its creatures in order to provide resources more cheaply, especially fossil fuels like coal, oil, and natural gas. The fact is that whether they live in a rich nation or a poor nation, most folks are just trying to have enough of what they need in the present. They generally mean well, but they may not understand how the choices they make now could hurt them or others in the future. In short, poverty and economic hardship can influence people to make choices they later regret. But life doesn't have to be this way. All over the world there are people teaching other people how to build a better, more sustainable life. And there are many organizations helping the poor to get the stuff they need (food, shelter, tools) until they can provide for themselves, without destryong the environment. There are also many organizations working in both rich and poor nations to help people learn to use their resources wisely and to care for their local ecosystems so that everyone has a better chance at getting what they need, now and in the future. There's a lot that kids can do to help out with this. Kids can take action to help the poor and needy in their local community or in other lands. Kids can get their family to donate money, or get together with others to hold a fund-raising drive. Or maybe just clean out their closets, bookshelves, and yes, even toy boxes, to collect nice things that they don't really need anymore and donate them to kids who do need them through their local church, Goodwill, or some other charitable organization. Kids can even have a grown up help them sell their old stuff online, and donate the money they raise this way! 1. You can refuse to buy products from companies that don't treat their employees fairly, such as paying them enough to live and giving "fair trade" for the value of their work. 2. And you can remind your parents (and other adults) to get out and vote, especially when there are laws or candidates on the ballot who will have a big impact on issues related to poverty or the environment. 3. You can use Use the Power of Information through your email, text messaging, and MySpace/Facebook/Twitter or other social media to make friends and family aware of important petitions that affect poverty and environmental issues. 4. You can remember to always treat people for who they are on the inside. For example don't avoid being someone's friend just because their clothes are shabby or out of style. Feeling liked and supported can help kids whose families are struggling with money problems to keep a positive attitude, do well in school, and create better opportunities for themselves. Take a stand against Prejudice! 5. You can help tutor another kid. It will boost their self-esteem and their education and job opportunities down the road. 6. You and your family can Volunteer and Give Service in your community with a local charity or relief organization. 7. Help your friends and family learn about and support solutions for Peace. The chaos, violence, and devastation of warfare and political violence is one of the leading causes of poverty. 8. Learn to live sustainably and support businesses, organizations, and laws that protect our Earth. 9. To give yourself even more opportunities and ideas to help, check out the list below you to find links to some great organizations who would like to help you make a difference in the struggle against poverty! Visit this very informative site to learn more about the problem of hunger in the world and what you can do to support CARE feed those in need. Started directly after World War II, to help those affected by the war, CARE seeks to create "a world of tolerance and social justice, where people have overcome poverty and live in dignity and security." Helping people have the food, housing, safety, education, and health care they need is what CARE is all about. Garden Harvest helps fight against hunger & poverty by providing food-producing animals to the rural poor in such places as Appalachia and India. To help Garden Harvest in its work you can buy a farm animal for a needy family (you select the animal on the GH website and pay GH the money and they take care of getting it to the family), "adopt" a farm animal (you will pay for it's feed, shots, etc. and it will provide milk or eggs for those in need), donate land to Garden Harvest (so they can grow food for those in need), or volunteer. Garden Harvest also appreciates the donation of farm equipment (such as tractors), all kinds of tools, as well as raw materials, like lumber. Visit their website or drop them some mail for more information. Global Fund for Children provides grants to small grassroots organizations improving education for children who would otherwise be left behind. Since 1976, Habitat for Humanity International has built more than 175, 000 houses, thus providing shelter for nearly 900,000 people worldwide. Now at work in 100 countries, Habitat for Humanity is building a house every 26 minutes. By 2005, Habitat houses will be sheltering 1 million people. Just as amazing, these homes were built by volunteers! Habitat for Humanity has lots of ideas for kids to help too! Click here to find out more. So much more than donating food to the hungry! Heifer International gives families the means to produce their own food and other necessary products -- eggs, milk, wool, honey, and even wax. 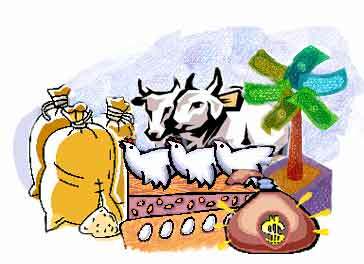 You choose what kind of animal to donate, provide the funds, and Heifer International will take care of the rest. (Vegetarians should keep in mind that some kinds of animals are intended for meat production.) If you don't want to donate an animal, you can donate a tree! Tree can stop the erosion that ruins topsoil and drinking water, and many of them also provide useful food items as well. What's great is that if you can't afford to give a whole tree (or a goat), you can probably afford to donate seedlings. Heifer International points out that 70% of the world's poor are women. Furthermore, Women produce 80% of developing world's food yet own less than 1% of the earth's land. Yet many of these mothers have no one to help them raise and feed their children. Heifer International's Women In Livestock Department gives these women their own livestock, so that they may feed their children and earn money needed for shelter, clothing, and school. How great would it be to hold a fundraiser through your school, church, or youth group to raise money to give these moms some lasting help? NetAid offers programs, activities and resources to engage young people in learning and action to help end poverty around the world. NetAid is part of a growing movement of people and organizations who believe that games have the power to foster new perspectives and effect change. 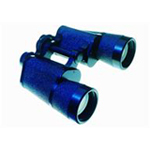 For example, their role-play game World Class lets students ages 10 and older take on the identity and situation of a real child living in Tamil Naduï¿½the site of an actual NetAid project in south India. Room to Read works for the education of under-privileged children in various parts of the world. So far they have built over 60 schools, and 700 libraries, throughout Cambodia, India, Nepal and Vietnam. This program, benefiting children in the U.S. and 41 other countries, allows you to aid needy children through donations, sponsorship, mentoring, and through online shopping at sites which donate a portion of the proceeds to Save The Children. Save The Children will help your sponsored child get enough to eat each day plus provide the child with clothes and much more, depending on the needs of the child and the amount of money you send. learn how kids can learn more about nature and living in harmony with it in the Earth's Kids KIDS CLUB! 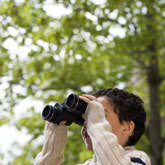 Don't miss Earth's Kids Spring and Winter fun and learning pages. pages for science and craft activities, reading and more! about ways to help grown ups and kids help our Earth! Wondering about the weather? 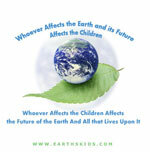 Don't miss the Earth's Kids special feature on Climate Change & Global Warming! 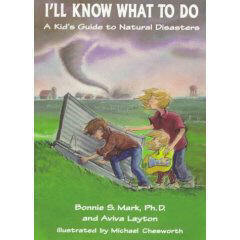 Learn how to keep your children safe in the event of a natural disaster. Tips to Teach Kids How to Wash Hands! Copyright Earth's Kids 1999. All rights reserved.